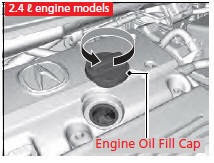 1.Unscrew and remove the engine oil fill cap. 4.Wait for three minutes and recheck the engine oil dipstick. Do not fill the engine oil above the upper mark. 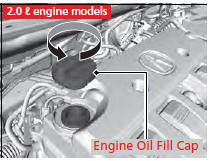 Overfilling the engine oil can result in leaks and engine damage.